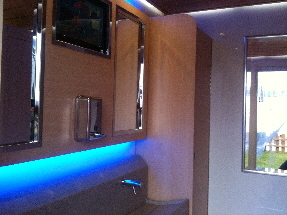 Our VIP mobile toilets are far more luxurious than your bog standard porta-loos! They are modern, comfortable, clean and convenient for when only the best loo will do! The toilets have a male side and a female side which is indicated with either pink or blue modern LED lighting on the steps. The female side features all private cubicles, whilst the male side features both urinals and a private cubicle for added convenience. Both sides feature easy-clean hand-wash stations, high-speed blade hand dryers, mirrors and television screens. 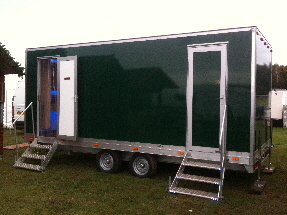 The toilets are trailer-mounted for quick and easy installation. We unfortunately are not currently able to offer a disabled or baby-change option. Interested in hiring the VIP Mobile Toilets for your event?